Frankie Edgar didn’t have to take his UFC 222 fight against Brian Ortega. Edgar was supposed to face featherweight champ Max Holloway for the belt. But when Holloway dropped out with an injury, young buck Ortega offered up his services. Despite having a well-earned title shot waiting for him, Edgar took the Ortega fight. And he got knocked out. Since then, both Holloway and former featherweight (and current lightweight) champ Conor McGregor have chimed in to show Edgar some love. Edgar is, after all, a no-nonsense fighter who’s given everything he has in every fight – a trait that has made him a fighter’s fighter. Frankie’s career deserved for that to be against me tonight. How’s that for respect from your peers? The post Conor McGregor and Max Holloway Show Frankie Edgar Some Love appeared first on Caged Insider. 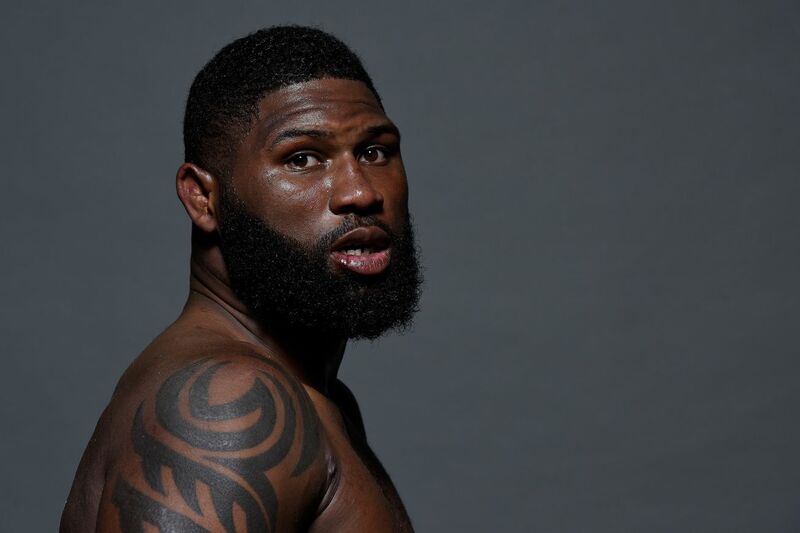 UFC heavyweight up-and-comer, Curtis Blaydes, is coming off the biggest win of his mixed martial arts (MMA) career after turning away Mark Hunt in the UFC 221 pay-per-view (PPV) co-main event last weekend in Perth, Australia (watch the highlights here). As a result, “Razor” is now one step closer to contending for the heavyweight strap. That might be a big deal to most aspiring 265-pounders, but Blaydes isn’t trying to become a household name. He just wants to show up and bust some heads — and get paid handsomely in the process. And if he can do it by recycling cans on the Bellator roster, then he’ll gladly have that conversation with Scott Coker and Co. after his UFC deal expires, which as it stands, has just one fight remaining. Blaydes wants a “decent offer” from UFC prior to his last fight. Prior to knocking around the “Super Samoan” at UFC Perth, Blaydes (9-1, 1 NC) put together four straight wins, one of which was overturned by the Texas Athletic Commission after he flunked for weed. Smoke Water under the bridge. In fact, his only loss to date came against top contender Francis Ngannou at UFC Fight Night 86 back in April 2016, a technical knockout loss that occurred when the cageside doctor rules Blaydes medically unfit to continue. It will be interesting to see how UFC matches him up (as well as how it plans to pay him) moving forward, but the heavyweight division is in dire need of young, talented contenders, so let’s keep our fingers crossed. For much more on UFC 221 click here. 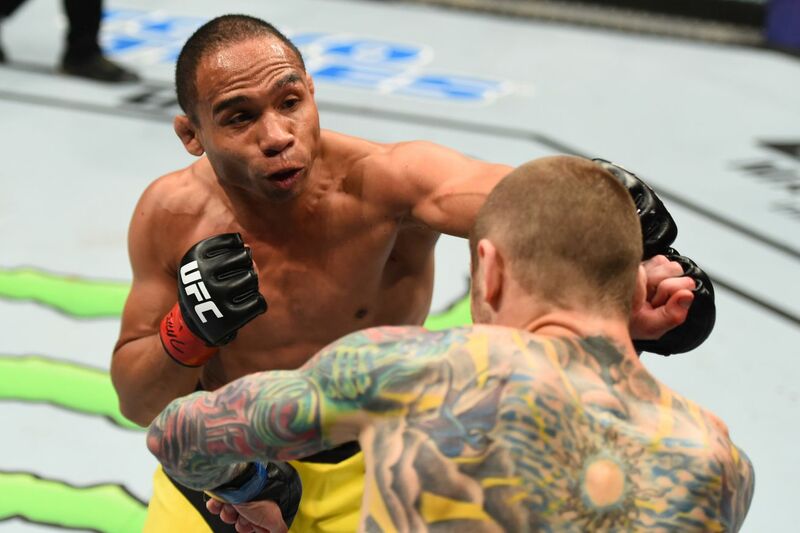 Despite not competing this weekend at UFC Fight Night 125 in Belem, Brazil, UFC bantamweight contender John Dodson will receive a portion of his show money after opponent Pedro Munhoz failed to make weight. The payout was originally reported by MMA Junkie and then later confirmed by MMA Fighting. Dodson, who was pegged to fight Munhoz in the co-main event at UFC Fight Night 125, was not expected to bank any money after Munhoz came in four pounds over weight, but the promotion has changed its mind. It comes as a little bit of a surprise considering UFC rarely pays out show money when a bout doesn’t occur, especially if both fighters are offered a chance to still compete. In this instance, Dodson could have accepted to fight Munhoz at a catchweight of 140 pounds but ultimately felt that the Brazilian probably weighed closer to that of a featherweight. Already in fight shape and eager to get back into the Octagon to shake off a recent split-decision loss to Marlon Moraes, look for “The Magician” to schedule a quick turnaround in the next month or two. For complete UFC Fight Night 125 results and coverage click here. 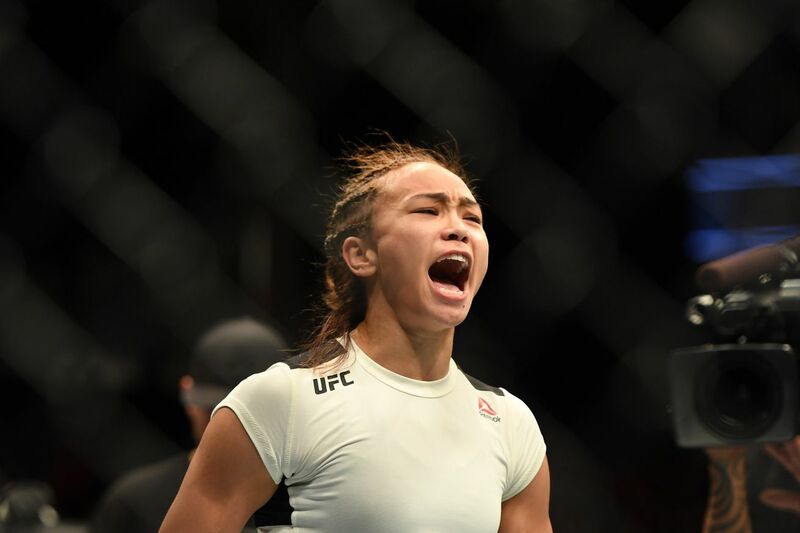 Ultimate Fighting Championship (UFC) strawweight sensation Michelle Waterson is branching out from mixed martial arts (MMA), much like the other “it” girl who used to compete at 115 pounds. But she won’t be Dancing with the Stars. Instead, Waterson will join the cast of the MTV reality show “The Challenge: Champs vs. Stars” premiering Tues., Nov. 21, 2017 at 10 p.m. ET, hosted by WWE wrestler and former contestant Mike “The Mix” Mizanin. This season, “The Karate Hottie” will be one of 10 celebrities trying to win a $ 150,000 for a charity of their choosing. She is joined by Olympians Kim Glass and Shawn Johnson, rappers Justina Valentine, RiFF RAFF, and Romeo Miller, former WWE performer Ariane Andrews (better known as “Cameron”), Season 10 Bachelorette winner Josh Murray, comedian Matt Rife, and former NFL star Terrell Owens. Waterson (14-5) is playing for her charity of choice, Merging Vets & Players (MVP), which pairs armed forces veterans with retiring professional athletes. The idea is to help both sides transition to a life after their respective endeavors. The former Invicta champ hasn’t competed since her submission loss back in April. The post Bellator Signs Mike Goldberg and Maura Ranallo for NYC Show appeared first on Caged Insider. This Friday night’s Bellator 179 card in London is a good one on paper, featuring the promotional debut of Rory MacDonald against England’s own Paul Daley. Yet the card lost one of its star attractions when Michael Page was forced out of his fight with Derek Anderson with a knee injury. Anderson was expected to be a significant test for “MVP,” who is undefeated in his professional career, including 8-0 in Bellator. And it smarted to learn that the fight was off only a little more than a week before he could try to take the goose egg from Page’s record. It also stung to lose the payday. “Yeah man, it’s difficult,” Anderson told MMA Fighting. “That’s how I make my money, so it just worries me when these things happen. I don’t know if I am going to be able to make rent if I don’t get paid. Luckily Bellator said it’s going to take care of me for this fight, and give me my show money. I was going to show up. Regardless [of Page pulling out], I was planning on leaving on the flight tomorrow and going over there, and saying, hey I’m here. For the 27-year old Anderson, signing up to fight British fighters has been a cautionary tale. He was supposed to fight Paul Daley at Bellator 163 in November, yet learned that Daley had to pull out the day before the fights at the weigh-ins. That time he had already went through the rigamarole of camp, his weight cut and the cross-country flight from his home in California to Connecticut. After having his sights set on Daley, Anderson was rebooked into a fight with Derek Campos in January, and he came up on the short end of a decision. With the Page news, the bad taste left in his mouth from that fight will have to linger. It didn’t help matters that Anderson saw himself as the perfect kryptonite for Page’s flamboyant striking style. Anderson said he didn’t mind playing the role of interloper in Page’s backyard of London, either. With the fight cancelled, it’s unclear whether Bellator will look to rebook Anderson-Page for another date. As of right now, Anderson said he doesn’t know what the plans are. One thing that bothered Anderson about Page’s short notice withdrawal was that injuries in MMA are prevalent and commonly fought through. He said he’s been dealing with his own slate of injuries, yet was going to go through with the commitment he made. As for whether he believed Page’s injury was serious enough to warrant him pulling out so close to the fight, Anderson said he had his doubts. Anderson said he would like to get back in the cage as soon as possible, and that Bellator had mentioned an August return. But he’s leaving himself open for one possibility — when Bellator makes its debut at Madison Square Garden next month, he wants to be ready in case something should happen. Namely, should something happen to lightweight title challenger Brent Primus, who fights Michael Chandler during the main event on the June 24 card. Primus and Anderson squared off in 2015, with Anderson losing a controversial split decision, that to this day he swears he won.